BOSTON, Mass. — Young immigrants with DACA status who have been able to get health insurance are worried about what happens next if the program is indeed eliminated, as the Trump administration announced. For those with serious or chronic conditions, the prospect of losing coverage is especially alarming. "I take 18 pills in the morning, and 10 to 11 at bedtime," says Luis Cruz, who is 25 and has had a kidney transplant. The total cost of medication without insurance would be about $3,000 a month. In 2013, shortly after graduating from high school, Cruz went to a Memphis emergency room with abdominal pain. Though he was already suffering from high blood pressure, he wasn't ready for the news that his kidneys were failing. "I was on dialysis for almost three years," Cruz told NBC News. He had to stop working full time at a restaurant and had to rely on his parents for medical and financial support. Cruz says it wasn't until August of 2015 that he was able to get a kidney transplant —though his uncle, the donor, had offered before that — in large part because of steeper costs related to how he obtained insurance. Though immigrants without legal status, including DACA recipients, can't enroll or buy into federal health plans, several states offer access to DACA recipients through their Medicaid plans. But Cruz's home states of Tennessee and Nebraska did not, so he bought a private insurance plan through Blue Cross, Blue Shield of Nebraska in 2013, paying $350 a month for the security of being able to control higher costs of his dialysis. His insurance was able to cover specialists one year after he enrolled, since he had a pre-existing condition. Until that time, he and his family paid thousands for emergency rooms, dialysis, and medications. Once his insurance kicked in and a donor was lined up, the cost of surgery was $350,000, entirely covered by Blue Cross, not including the cost of medication. If DACA is gone, what happens to jobs, and insurance? DACA recipients get a personal identification mechanism like a social security number, which has allowed them to apply for jobs. The majority of DREAMers are employed. According to an August 2017 survey conducted by the Center for American Progress, about 57 percent of DACA recipients said they "got a job with health insurance or other benefits." Eliminating DACA means thousands are at risk of losing their jobs, as well as their access to employer-backed insurance plans. For those who bought into private insurance plans, a loss of a job — and income —means it's harder to make monthly payments in the event that their insurers allow them to keep a policy without a social security number. Most private insurers require a social security number is needed. Do individual states offer any options if DACA is gone? New York, California, Massachusetts, Minnesota and the District of Columbia allow DACA recipients to apply for state and district-funded insurance, or in most situations, Medicaid. In Minnesota, DACA grantees who are under 200 percent of the federal poverty level can apply for limited benefits through MinnesotaCare, a fee-for-service situation with premiums ranging from $4 to $80 per month and none for children under 21. New York offers a little more, and considers its 42,000 DACA recipients and even those who are undocumented to be something called "PRUCOL," or people residing under the color of law. This is due to a a 2001 Court of Appeals ruling that said denying Medicaid to legal residents violated clauses of the state and federal Constitutions. As a result, DACA recipients can apply as long as their incomes are at or below 138 percent of the Federal Poverty Level, or $16,642 for a single person. Becca Telzak is the Director for Health Programs at immigrant advocacy group Make the Road New York. She told NBC News that the organization is holding workshops across the city to discuss potential changes to DACA. She hopes that former DACA recipients will be able to still be considered for coverage by the state. "They [DACA recipients] are considered PRUCOL which allows access to Medicaid even after the date they lose employment authorization. That means those on Medicaid can potentially still stay on Medicaid. this is what we hope will happen." While the decision rests in the hands of state-level health officials, New York City told NBC that they would support DACA recipients regardless of status. "New Yorkers, regardless of immigration status, should know that they will still have access to the City's health services," said City Hall spokesperson Saul Stein." California takes a more liberal approach. All children under 19, regardless of immigration status, receive health care. The rest of DACA recipients have access to the California Medical Assistance Program (Medi-Cal), a Medicaid program as long as they're at or under 138 percent of the federal poverty level. After Trump's decision on DACA, California released a statement, updating its website, saying there would be no changes if DACA recipients met eligibiblity requirements. What Do College Students Do? For some DREAMers, college is the first time they have gotten regular preventative care and a primary care physician. Matthew Lopas is the Health Policy Attorney for the National Immigration Law Center. 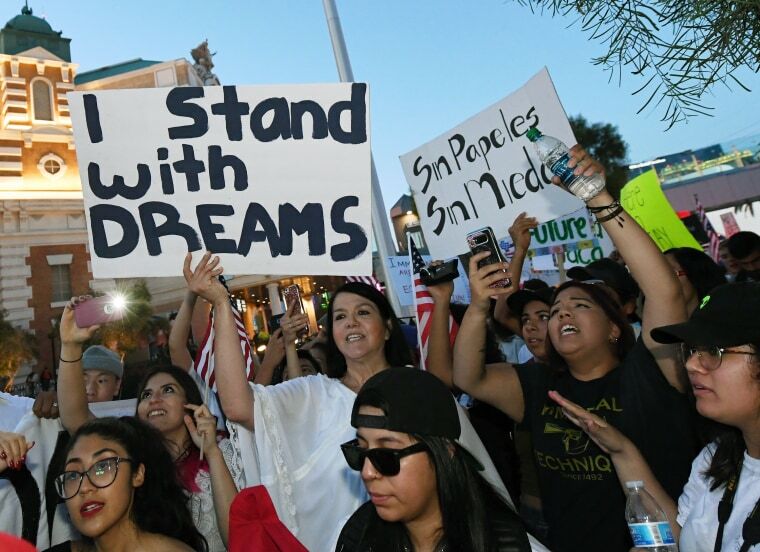 "I've talked to DACA recipients who have said, when they went to college, it was the first time in their life that they had health insurance, and for some it was the first time they saw a doctor besides an emergency," said Lopas. A handful of universities and colleges, like Harvard University, offer DREAMers health insurance. Uriel Espinoza, 20, is a junior at Harvard College, and has full, free coverage with Blue Cross and Blue Shield through the university. He did not have insurance from first to fifth grade, before his family moved from Georgia to Illinois. Illinois has a program that provides health insurance to all children under 18. But providing health insurance for immigrants with complicated immigration statuses is not the norm. Sayde Sanchez, 20, is paying her own way through college in Indiana. She's gone to a community college for her first two years and is transferring to Indiana University in the Spring. She has no health insurance, other than partial dental coverage through her mother's employer coverage. Her mother's health insurance though Allied Benefit Systems Inc. won't cover her. Sanchez is currently footing half of a $5,000 bill for her braces. In addition, she pays full price for all of her classes because the college, like many, does not offer state tuition rates to DACA recipients. Sanchez was rejected from Indiana Medicaid becausethe state's program is mostly subsidized by the federal government. Not knowing DACA recipients cannot receive coverage through Obamacare, she applied, and was promptly rejected. Sanchez says she suffers from anxiety and depression, and pays out of pocket to see a therapist. "I have to go to therapy, which is really expensive. It's $100 a session every two weeks, plus the monthly medicine really adds up. But there's no other option." Lopas leads a team of attorneys lobbying Congress to sponsor bills that would change the Affordable Care Act's (ACA) exclusion of DACA recipients in federal insurance programs. "During the Obama years, we spent a great deal of time advocating to the administration that it was not in the spirit of the ACA to do this," said Lopas. Dreamers like Sanchez agree that DACA without federal health insurance access has been rough. "Health care is a really important topic that isn't included in DACA. You can get work permits, but insurance is important because it’s costly." The most promising piece of legislation in the Republican-controlled Congress, he said, is the HEAL for Immigrant Women and Families Act of 2017, sponsored by Michelle Lujan Grisham, (D-NM). The bill requests that any immigrant "granted federally authorized presence" in the country, as is the case with DACA recipients, be eligible for federally funded health care programs. But considering the contentious situation surrounding the fate of DACA, it's not likely that this would be passed anytime soon.